Phoenix, AZ, Sat. Sept 29th, 2018- Thirty players and four dedicated coaches enjoyed the latest in a series of “Friendlies” hosted by the Hayden HS Handball team and Arizona State University. Students from Hayden and Glendale high schools along with Tucson’s great Fred Lewis Foundation, proved their mettle all day long in the central Arizona sun. For some, it was their first opportunity playing small ball, while for others, it was their first taste of three-wall action. Members of the Arizona State Sun Devil Handball team rounded out the participants. 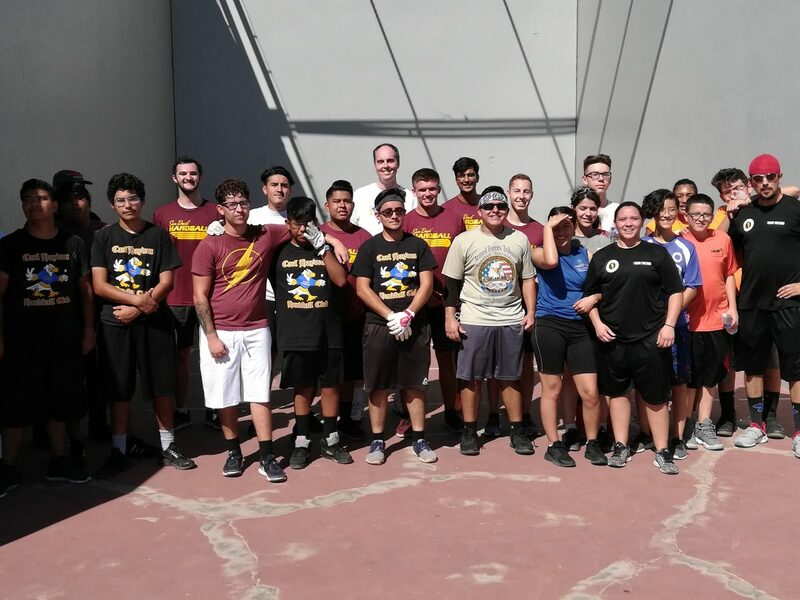 Throughout the event, the Sun Devils found opportunities to work with the junior players and mentor them on sportsmanship, striving for excellence, the importance of academics & community service, and handball techniques. Hayden coach Chris Hogan’s generosity continued with a lunch that ensured no one left hungry. No entry fees were required from the players. All the food, beverages and balls were donated by handball enthusiasts! This Friendly serves as a “Tune Up” for the Hayden Car Show & 3 Wall Handball Tournament scheduled for Sat. Nov. 17. That outdoor event combines a handball tournament with classic low-rider style cars on the Hayden campus in central Phoenix. Stay “tuned” for more info about that event.